Anybody out there like wine? Yeah, I thought so. Us, too. My sommelier-for-eternity XFE and I love wine and have really gotten into good wines over the last couple of years. We even invested in a wine fridge. 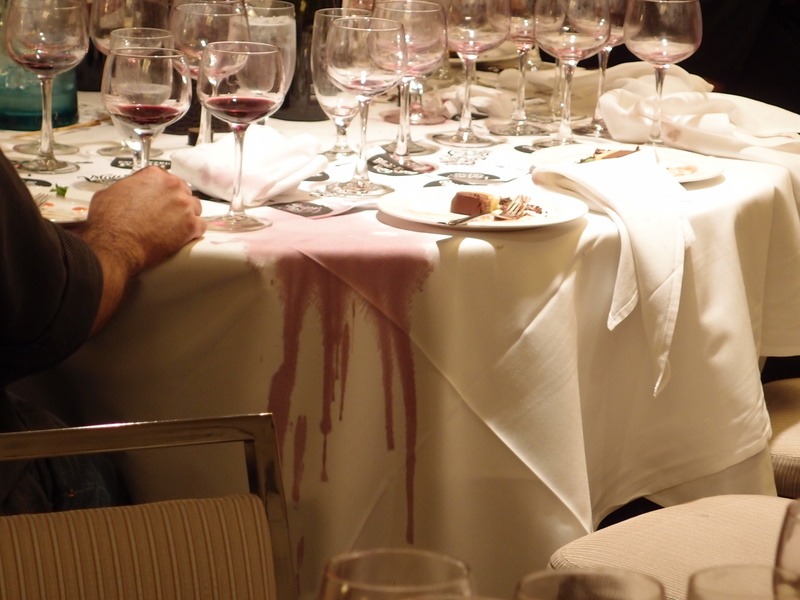 So when Kimpton Hotels tweeted that they would be holding a winemaker’s dinner, XFE looked into it. Turns out, the dinner was being held by an Australian winery called Molly Dooker . WHAT? We’re going to Australia! And we like Australian wines! In fact, we’re trying to plan a few days of winery tours in our Australian trip, but there are so many great wine regions, we’re still trying to decide which one makes sense for us – Barossa, Clare, Hunter, we’re just not sure. To top it off, Molly Dooker was holding a contest to name their next wine. AND the winner of the contest would be named at the DC wine dinner at the Hotel Palomar. 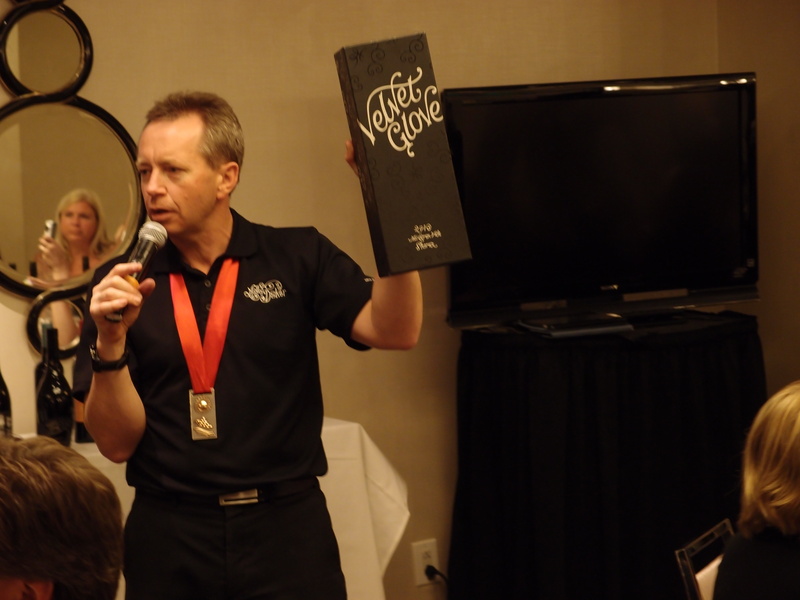 The prize was awesome – a trip to Australia and a stay at the winery! Destiny had spoken. We began brainstorming names for the new wine, which is a sparkling shiraz (We’d each have 10 opportunities to enter). We began researching Molly Dooker, which we found out was Australian slang for “left handed,” since the two owners, Sparky and Sarah, are both left handed. Pretty freaking adorable, huh? Yeah, we thought so too. All in all, it seems like a very fun winery, doing some pretty fun things, but how’s the wine? 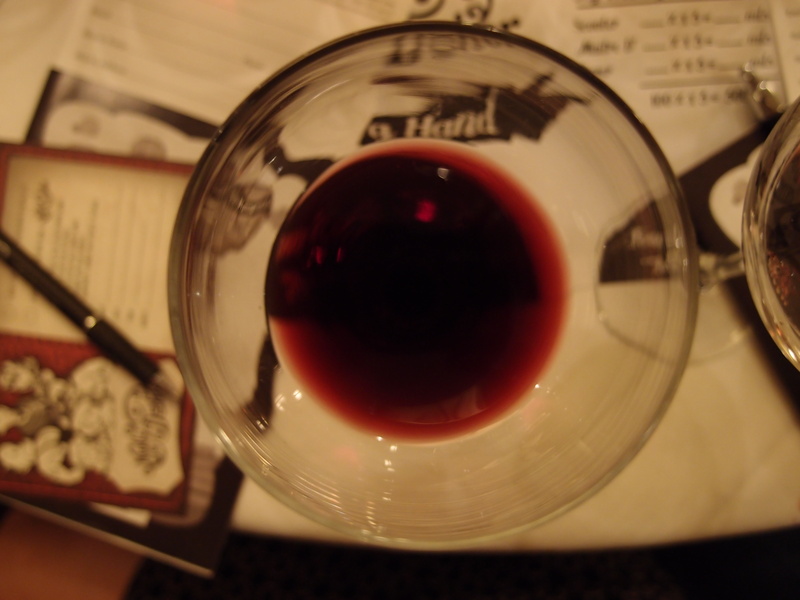 Well, we had plenty of opportunity to find out at last week’s wine dinner. It started with a little appetizers – crab cakes and satay skewers, and their white wine, the Violinist. The Violinist is a verdelho, which I have never heard of, but it was very delicious. And well, we do love crab cakes. We moved to the main event. When we got into the room, there was TON of wine and lots of glasses waiting for the wine. Each setting had five or so glasses. So, we took a deep breath, pulled on our big girl pants and settled in to get an education on Molly Dooker wines. Sparky (and like his name suggests, he’s a real live wire) started off explaining how the wines are made with nitrogen to protect the wine from sulphites. But nitrogen isn’t too yummy in young wines. And if you want to drink the wine instead of having to store it forever (and believe me, you do want to drink it), you need to release the nitrogen gas by shaking up the bottle and letting it settle for a few minutes. 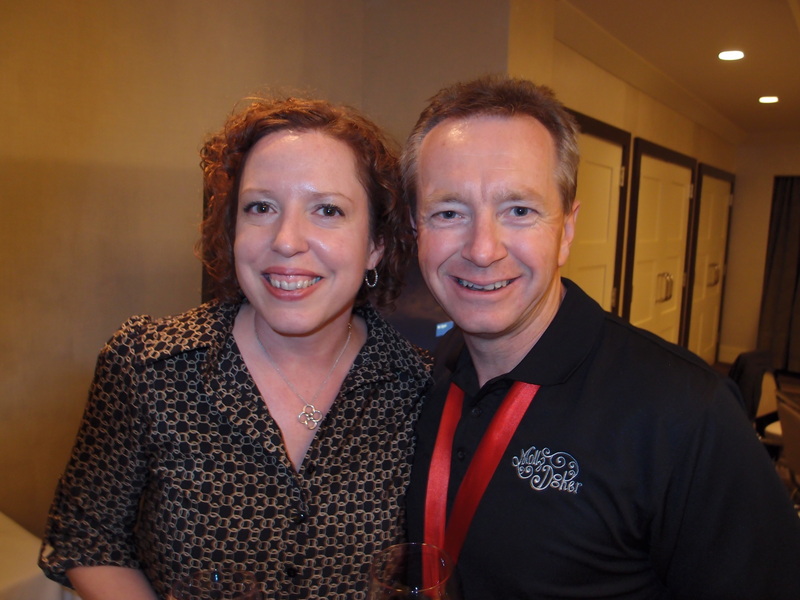 We actually tasted two wines – one shaken, one not – and let me tell you, it’s better shaken. I'm getting low, can someone fill me up? We tasted several reds – including (up to that point at least) my favorite, which was—surprisingly for me—a cabernet sauvignon called Gigglepot. We then tried the Scooter (a merlot), the Boxer (a shiraz), and the Maitre D’ (a cabernet sauvignon). Building on our new expertise, we did a fun little experiment where we mixed the three to try to come up with our own blend similar to their shiraz/cabernet/merlot blend, Two Left Feet. We mixed enough to share with the entire table in our mad scientist plastic beakers. XFE was taking this quite seriously, by the way. We voted on which of the four groups at our table had the best blend. Then we drank it. XFE challenged folks at the table to put some money in to make it interesting. 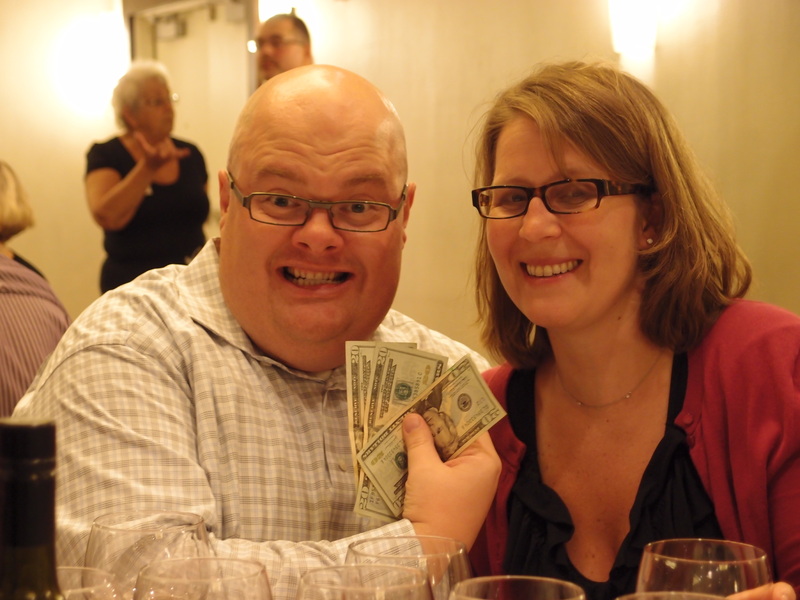 A very nice couple won the $60 pot. No, not us. We did nothing but lose. After that, we were all feeling pretty good, listening to Sparky regale us with tales of winemaking, explaining the meaning and features behind all the wine labels (check out their website for details. It’s really well done), and proud Papa stories about his (and his children’s) illustrious go-cart careers. Apparently, that’s a thing. Me and Sparky at the end of the night. I don't know how he does these dinners every night. Well, the tastings weren’t over yet. 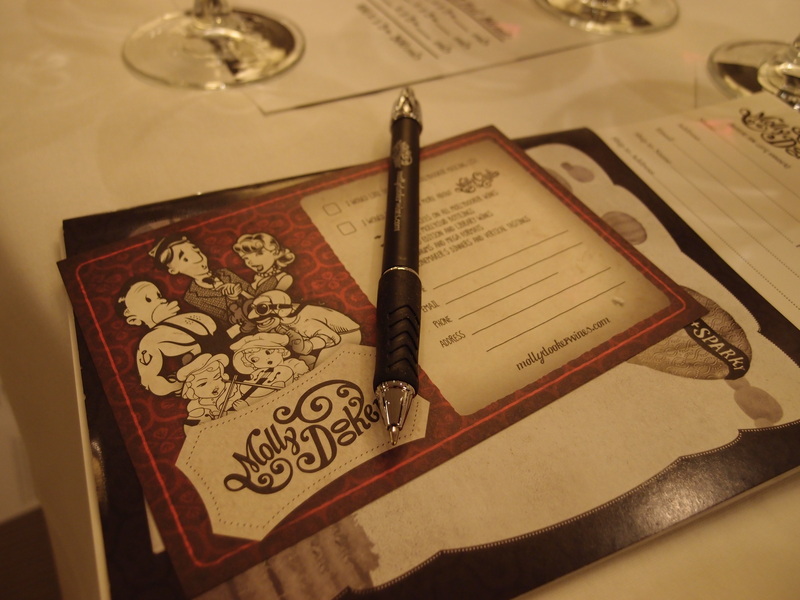 We then turn over our placemats and there are spots and notes for FIVE more wine tastings! Whoa. Thankfully our food came out, a (slightly) overcooked beef dish with wine sauce and some veggies, and a yummy chocolate/caramel dense mousse thing. I’m not really sure what it was, but it hit the tipsy spot. 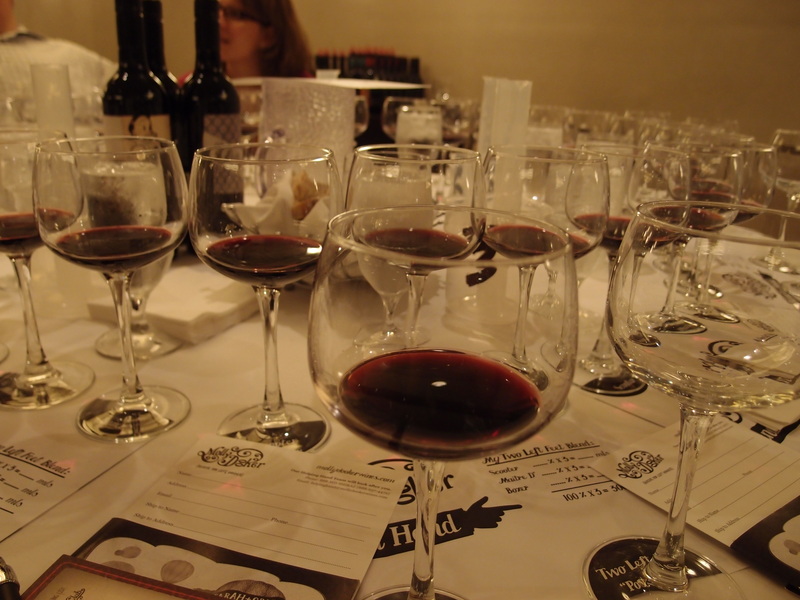 For our second round of tastings, we tried Molly Dooker’s Enchanted Path, a shiraz/cabernet blend, Carnival of Love, a shiraz, Blue Eyed Boy, another shiraz, and the piece-de-resistance, the Velvet Glove. It’s also a shiraz, but it was unbelievable. So, so good. I can’t describe it other than to say velvety. Interesting story – a forklift recently dropped about $1 million of Velvet Glove headed to the U.S. That was about 1/3 of the year’s production, so the 2010 quantities of this $200 a bottle wine are going to be quite limited. Which is very, very sad indeed. Be careful with that, Sparky. We wouldn't want another incident. Despite our extremely excellent 20 name suggestions, we did not win the Label Our Lefty contest. Someone with the wholly unoriginal name of Miss Molly won. Yes, I’m bitter grapes about that. But Molly Dooker can probably make some excellent wine even out of bitter grapes. And now our decision on which wine region to go to when we go to Australia in March has been further complicated by the fact that Molly Dooker is in McLaren Vale, which was not an area we were even considering originally. So, we’ll see. First World Problems here, people. Some people just can't handle their wine. Amateurs.